It's 23rd July and Daniel turned 26 today. Happy Birthday Dan! He probably is filming Swiss Army Man but let's hope he will have an awesome day. The Birthday Project from this year with Glowing Radcliffe, Portal Radcliffe, DanielRadcliffe.de and Daniel Radcliffe Brasil is in it's final stages. A huge thanks to everyone who participated. Edit: check the updated Tumblr page. Feel free to wish Daniel a Happy Birthday via the website, Facebook or DanielJRadcliffe.tk's Twitter. 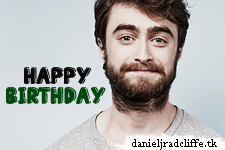 :) If you mention @DanJRadcliffeNL with your Happy Birthday wish to Daniel it will pop up below. I will be re-tweeting some of those through the day.